For centuries, Hindus have observed countless rituals and traditions from dawn to dusk in their everyday household chores. 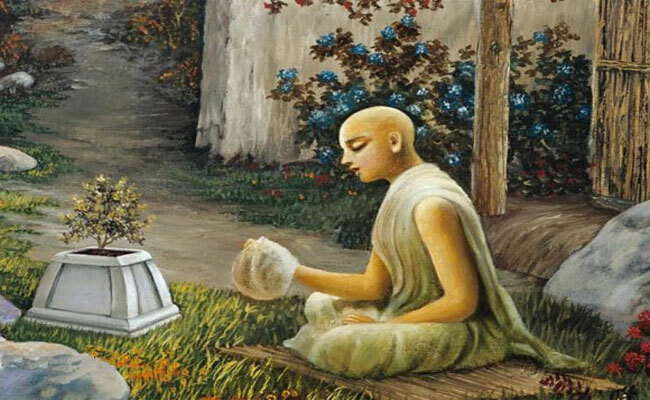 Some are mentioned in Vedic scriptures and some are added later during the ages of Brahman scriptures. While conservative Hindus follow the rituals religiously, our intelligentsia have found scientific reasons behind Hindu rituals and traditions. We have listed some traditions Hindus have followed over the years; traditions are still in practice in all Hindu households. 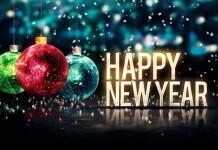 Surprisingly, these traditions are equally popular outside India, wherever Indians live. 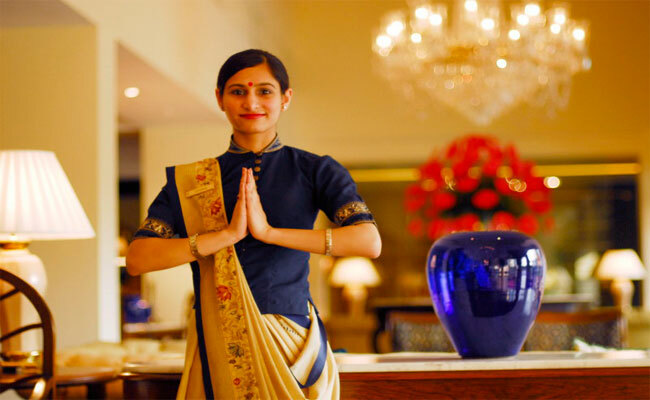 Namaskar or Namaste is an Indian style of greeting people; it is a way Hindus give respect to others. While joining two palms together, people join the tips of all the fingers together, which further create pressure on points of ears, eyes, and mind. Pressing them together is said to turn on the pressure points which helps us remember that person for a long time. This also ensures that people do not get germs as they don’t shake hands. Married Indian women wear silver toe rings on their second toes; a nerve from the second toe is connected to the heart through the uterus. Wearing toe ring strengthens the uterus; this also regulates blood flow and manages menstrual cycle effectively in women’s body. Silver is a good conductor, which absorbs polar energies from the earth and passes it to the body. This practice is normally found in many countries apart from India. But there is science behind this tradition; in ancient times, people used the currency of copper. 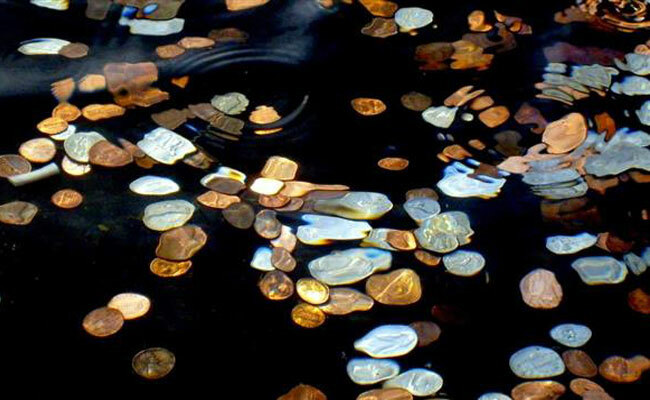 This metal is vital for our body; by throwing copper coins in the water, people used to consume copper through the drinking water obtained from the river. There is a small spot between the two eyebrows on the forehead; this spot is considered a major nerve point in our body. The red Tika or Tilak is considered as energy-saver; applying kumkum between the eyebrows is believed to keep energy in the body and control different levels of concentration. When we apply kumkum in the middle of the forehead, we automatically press Adnya-chakra; this energises the blood supply to our facial muscles. 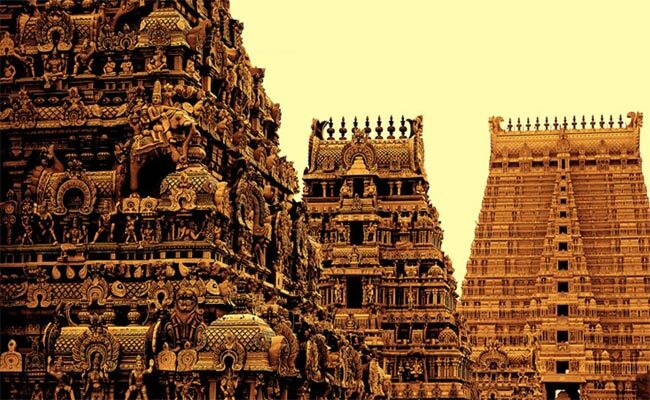 5) Why Do Temples Have Bells? Ring of bells clears our mind and helps us stay focused on our worship. 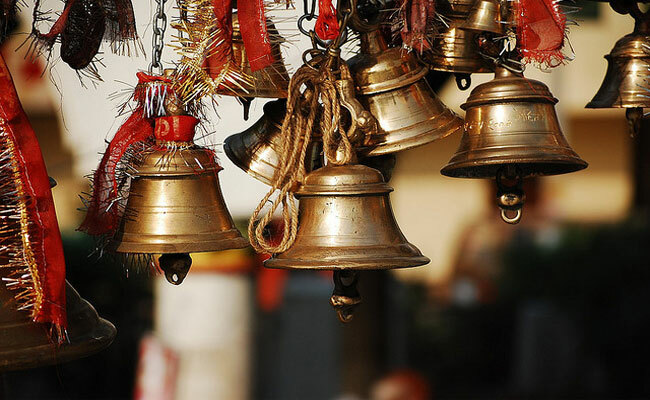 The bells are made of special technique; the sound of these bells creates a unity in the left and right portions in our brains. When we ring the bell, the echo of sound lasts for a minimum of 7 seconds; during these 7 seconds, our body activates all the seven healing centres. This removes all negative thoughts from our mind. 6) Why We Start With Spice and End With Sweet? Our meals start off with spice and end with some sweet. According to science, spice activates the digestive juices and acids to boost our digestive system efficiently; sweets contain carbohydrates that bring down the digestive process. Therefore, sweets are always served at the end of meals. 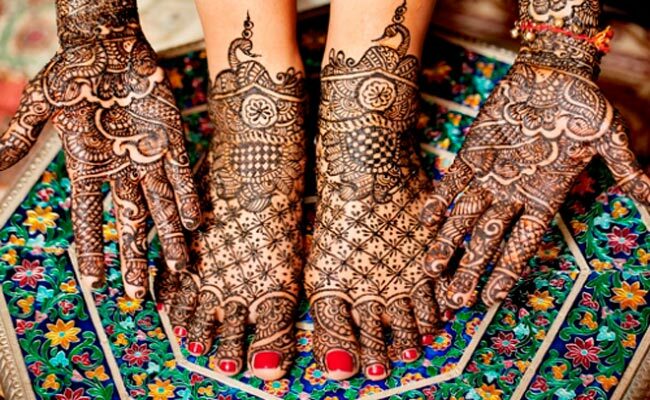 7) Why Do We Applying Mehendi/Henna On The Hand And Feet? 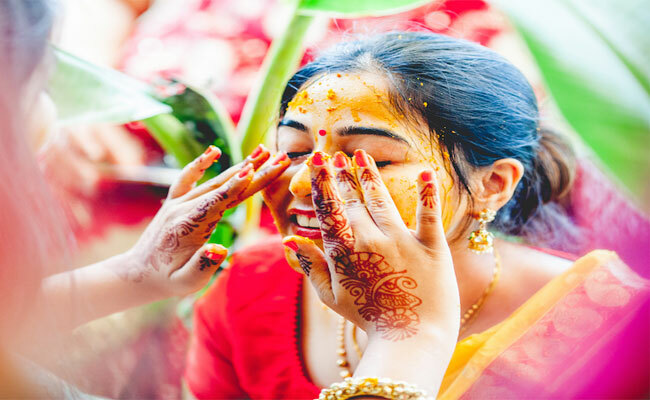 Mehendi has medicinal qualities; since our Indian weddings include many stressful events and rituals, brides sometimes feel a headache, stress and fevers too. 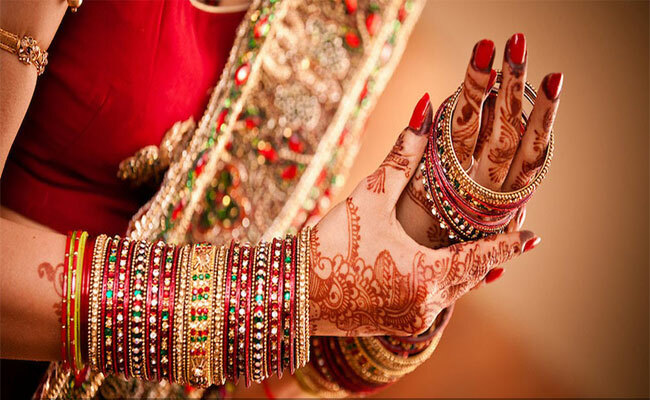 Mehndi can avert stress with its cool medicinal values; therefore, brides and grooms apply mehndi on hands and feet. 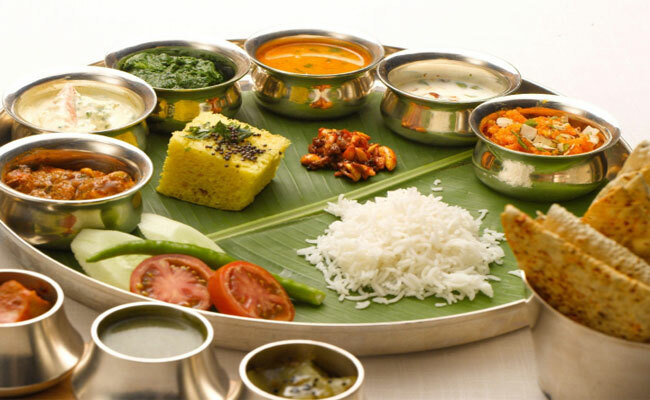 Indians and many people from eastern countries sit in “Sukhasan” position during lunch and dinner. Sukhasan is one of the important Asanas in Yog; in this position, we sit cross-legged. This posture immediately brings a sense of calm and helps in digestion; our brain automatically receives a signal to prepare our stomach for digestion. 9) Why You Should Not Sleep With Your Head Towards North? Our body includes magnetic field and Earth is a giant magnet. When we sleep by keeping our head towards north, body’s magnetic field gets completely uneven to the Earth’s Magnetic field. That creates problems connected to blood pressure and our heart requires working harder to beat this irregularity of Magnetic fields. Another reason is that human body has a great deal of iron in our blood. When we sleep by keeping our head towards North, iron from the whole body starts to assemble in the brain. This can create a headache, Alzheimer’s Disease, Cognitive Decline, Parkinson disease and brain degeneration. 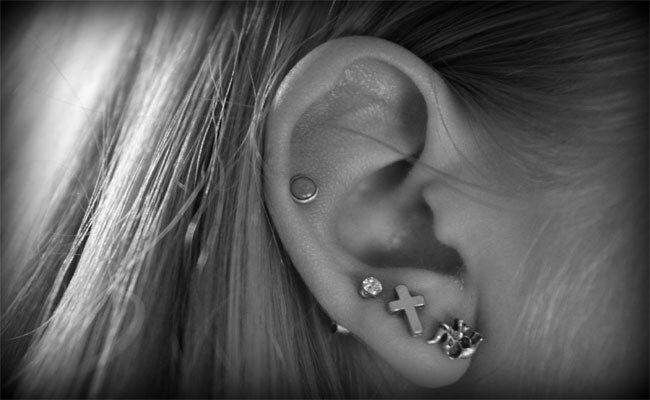 10) Why We Pierce Ear? Ear piercing can boost our intellect, power of thinking and decision-making faculties. It is believed that more we talk, more our energies get drained; piercing ears can restrain our speech; this also prevents our insolent behaviour. The practice also frees our ear-channels from disorders. 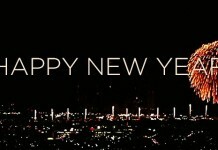 This tradition is now accepted everywhere across the globe. Hindus worship all natural phenomena; the sun is worshipped as the god of energy. Hindus chant prayers to Sun by offering water; during this practice, we look at the Sun rays through the water. This is good for eyes as it improves vision. Moreover, we tend to get up early in the morning and complete all morning rituals in the morning. Making the most of the sunlight is also the reason behind this tradition. 12) Why Do We Fast? As per Ayurveda, Indian treatise on medicine and herbs, the basic cause of any ailment is the growth of toxic materials in the stomach. Fasting helps us cleanse that toxics gathered in our digestive system; moreover, our digestive system needs rest from daily activities. 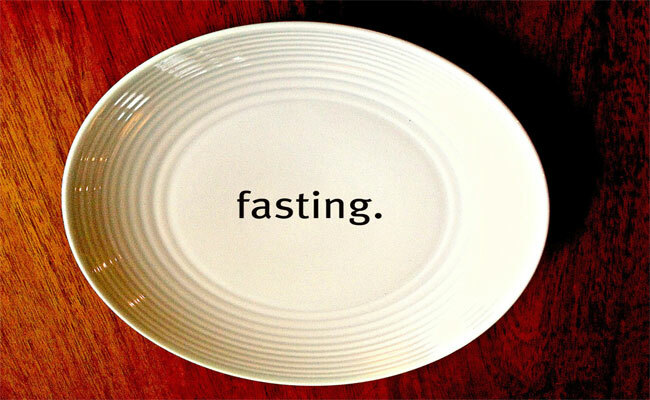 Fasting gives that rest to our entire digestive system and organs in the body. Thus, fast of the entire day is good for health; however, we should take lemon juice at regular intervals to maintain energy in our body. 13) Why Do We Touch Feet of Our Elders? Cosmic energy flows in our body from one end to another; it is connected between two minds and hearts. It is this energy that is transferred through handshakes and hugs; moreover, the cosmic energy gathers at our fingertips, and therefore, when we touch feet of our elderly, it is transferred to the one who touches the feet. In this manner, fingers of hands become receptor and fingers of feet become a giver of energy. 14) Why Do We Worship Peepal Tree? Normally, trees produce oxygen during the day and emit carbon dioxide during the night; but very few of us know that Peepal tree produces oxygen during day and night. And therefore, our ancestors started worshiping Peepal tree. 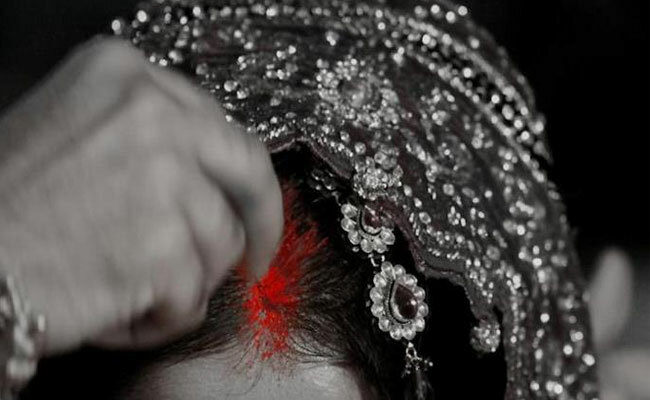 15) Why Married Women Apply Sindoor or Vermillion? 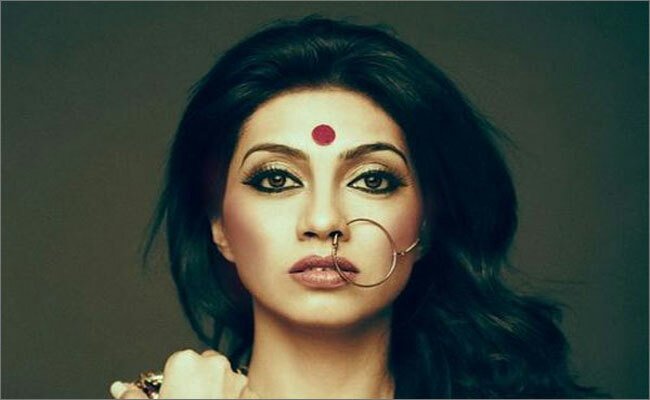 There is a physiological reason behind Sindoor application by married women. Sindoor is made of turmeric-lime and metal mercury; mercury not only controls blood pressure but also ignites physical passion. This could be the reason why widows are not allowed to apply Sindoor. For better results, Sindoor is applied right up to the pituitary gland, which produces hormones that influence growth and sensual development. Mercury is also believed to remove stress and strain. 16) Why Do We Worship Tulsi Plant? Tulsi is considered as a mother by Hindus; Tulsi, which is Basil in botany, has many medicinal properties. Basil is antibiotic, which increases immunity if taken every day. It is believed that if a person consumes basil every day, he or she can live a long and healthy life as the plant prevents diseases and stabilizes health. Moreover, the fragrance of Tulsi averts mosquitoes and other insects; it is also believed that snakes do not tread near Tulsi plant, and therefore, ancient people used to plant Tulsi near their houses. 17) Why Do We Worship Idol? As per modern psychology, man shapes his thoughts as per the object he sees. Man’s thinking changes according to the objects he sees. Idolatry was observed in ancient India so that people can absorb the shape of idols in their minds and thereby concentrate; this is the way to gain spiritual energy without losing concentration. 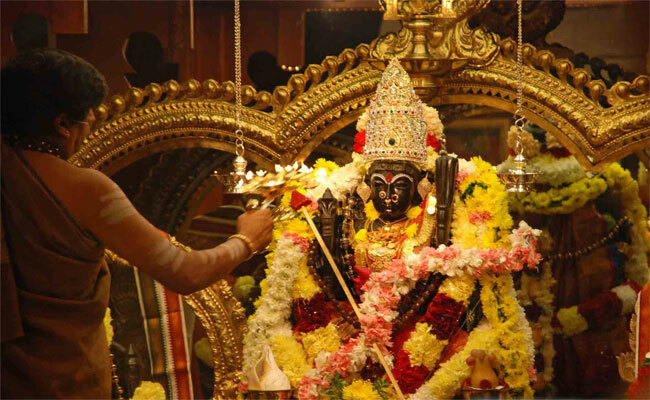 An idol in the temple can help increase concentration while offering prayers. 18) Why Do Indian Women Wear Bangles? The wrist is the most energetic part of human body, and hence, it generates a lot of energy; women wear bangles around their wrists. During many household chores, wrists come into contact with bangles and create friction, thus increases blood circulation. Moreover, the electricity passing out through the outer skin is again reverted to one’s own body because of the ring-shaped bangles, which has no ends to pass the energy outside but to send it back to the body. 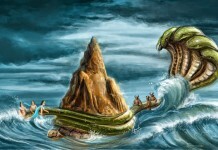 19) Why Should We Visit Temple? Magnetic and electric waves are constantly passing under the earth; when we build a temple, architects and engineers select a piece of land where these waves are available in plenty. The chief idol is placed in the centre of the temple; this place is also known as Garbhagriha or Moolsthana. The temple is built around once the idol is placed (Pran Pratistha). The idol is placed where magnetic waves are highly active. During the placement of idol, we bury some copper plates beneath the idol; the plates are inscribed with Vedic scripts; these copper plates absorb magnetic waves from the earth and radiate it to the surroundings. So if a person regularly visits a temple and walks around the idol clockwise, his/her body absorbs the magnetic waves. 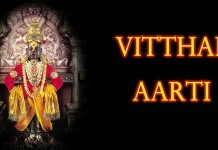 People who regularly visit temple receive this positive energy and live a healthy life. 20) Why Do We Apply Haldi? Haldi or turmeric is a natural herb; it is the best anti-septic given by Mother Nature. Its application on the body ensures that all germs on the skin will be killed. Moreover, turmeric absorbs all dirt from the skin and provides radiance to the skin. To give moisture to the skin, people also add oil to the turmeric. 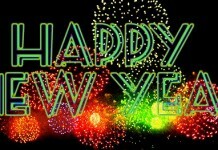 Holy fireworks as a natural cleanser; it removes negative energy from the environment and fills the air with positivity. 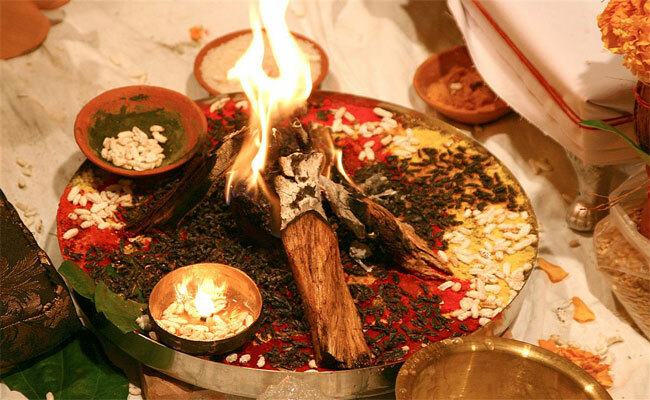 Moreover, the fire is fuelled with different kinds of wood, ghee, rice and other herbs. The smoke produced by the fire purifies the air by killing insects. This creates a positive impact on the health of people who attend the marriage. The couple gets more benefit as they are close to the fire. Fresh green leaves filter the air and make the surrounding neat and clean; a hygienic atmosphere is necessary for an auspicious occasion like a wedding. Mango leaves are believed to add more elegance to the decoration, and therefore, people tie torans made of mango leaves at the entrance of their residences. Chanting Om Kar is believed to reduce blood pressure and control heart rates. If OM is pronounced after taking a deep breath, it improves the sense of alertness and thus, concentration. 24) Why Gayathri Mantra Is Chanted In Prayers? Chanting Gayatri mantra produces almost 110,000 different kinds of waves per second. Researchers have confirmed many scientific potentialities of Gayatri mantra. 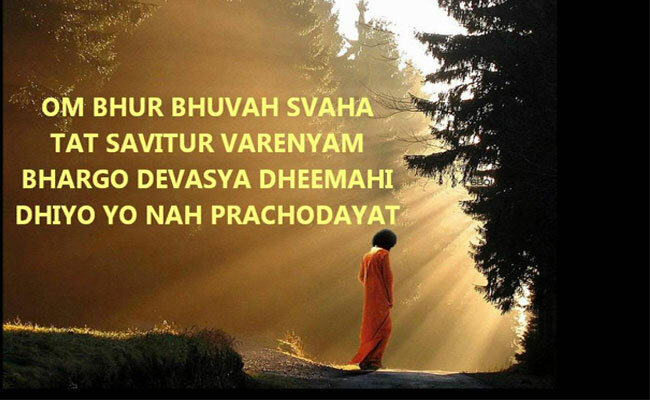 It boosts our health immensely if we chant Gayatri mantra 90 minutes before the sunrise. This could be the reason why Radio station at Paramaribo (part of South America) broadcasts this mantra from 7 PM onwards every day.